Design starts with a rough idea of a theme, then a black and white sketch, before finally a refined final design, like this one is made. A full-size replica of the design is made and cut into pieces. Those cut pieces of paper are used to cut the appropriate pieces of glass. The glass is all cut out, and a final inspection is made to ensure the correct color have been chosen. 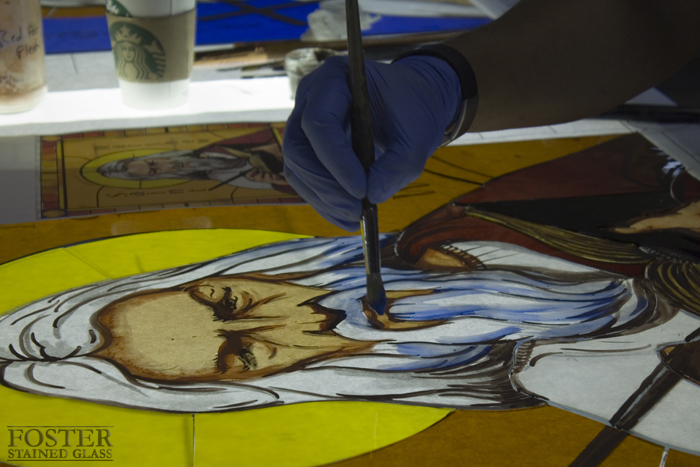 Rex paints the glass with a special glass paint made of crushed glass powder. This paint will be fired into the glass at approximately 1200º Fahrenheit. The window is assembled, one piece at a time, on the paper pattern. A water-proofing glazing compound is forced between the glass and the channel of the lead came, adding stability. The excess compound and residue will be cleaned off the window, then the glass and lead will be polished. Steel bracing bars are soldered to the window to add strength and to mitigate the effects of gravity on the lead came.